First thing which reminds me of Churmundo is my Amma. She is an expert in making these ladoos. If we are visiting our relatives they were sure that they are going to get Churmundo:-) As a kid, I used to sit beside her and act as if I am watching how she does it but the fact was I wanted to eat in small amounts until she finishes rolling the ladoos. Then gradually even I started to help her in making these ladoos. 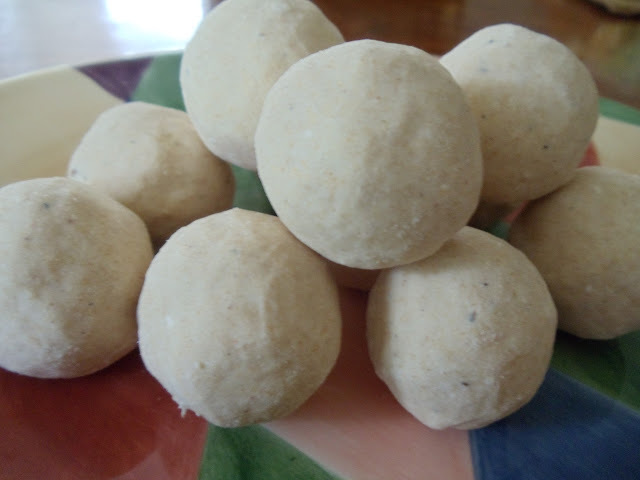 I have heard from many people that its very difficult to make these ladoos. But I never felt so. These ladoos are easy to make and trust me they will just melt in the mouth. Take wheat flour in a pan and add ghee to it. Mix it well and fry it on a medium flame until you start getting the aroma. This might take 10-12 minutes (keeping on a high flame might burn the flour). Now turn off the heat and allow it to cool. When completely cooled, add powdered sugar and cardamom powder. Mix well. Now take little amount of mixture in your palm and roll it into ladoos (The mixture is not so sticky and hence requires more care while making them. If you feel difficult in making ladoos then add little amount of ghee which will increase the stickiness and hence less difficult to bind the mixture). Churmundo is ready!! Store them in a container. My pleasure Amritha :) do try making it..